Those who really like chess always invest in at least one truly special chess board. A quality setup can act as not only a fun way to play, but also as a display piece. Nothing catches attention and also has a very futuristic look like 3D chess boards. There were very few options that fit in this category even a few years ago, but more and more companies are getting in on it. Here is an look at four of the very best out there right now when considering price, uniqueness and overall playability. Anyone looking for a dragon themed chess set will find it difficult to spot anything as detailed and unique as this. The company put a lot of effort into making this chess board not only unique, but extremely playable as well. The first thing that will catch the attention of anyone checking this set out is the chess board base. The details on the base are beautiful, showing a number of dragons, castles and more. It is a durable base as well, so people don’t have to worry about being too careful with it if they plan on playing a lot. The poly-resin base has a glass board sitting a top, giving it the 3D look that is an instant eye catcher. The actual squares of the chess board are part of the base, and the see through board itself almost appears to be floating in midair. There are four towers on each corner to help provide support and round out the look of the board and the base. When looking at the dragon-themed pieces, the colors are beautiful, and the details are second to none. It is always important to make the pieces different enough colors so that it is not confusing when playing. The silver and gold look definitely makes it easy enough to figure out. Each piece is made of pewter, meaning that it is durable and very unlikely to wear away even after somewhat heavy use. A very minor complaint, but the king and queen pieces look very similar, with just a slight change in height. When just glancing over the board, it takes a little bit of effort to remember which is which. They should have changed the design up a bit more, or at least made the height differential more extreme. This Dragon Chess set, in total, is 15.2 inches x 15.2 inches x 5.2 inches. When looking at just the plain surface, its is a 13.5″ square. The pieces top out at 2.75 inches for the king. The set itself weighs in at about 23.9 pounds, but it is still fairly easy to move around once in a while. All the pieces have good weight to them, adding to playability. The Medieval Knights is another option for people who want a futuristic look while also sticking with a classic theme. This is a very unique looking chess board, with the biggest highlight being the table pretty much suspended in air thanks to four castles on each corner. First, the base of the chess board has a great amount of detail. Made of metal, it is a durable base that can withstand a lot. It also does a great job balancing out the color, since the chess board is clear. That clear glass board is suspended about nine inches up in the air. This is the feature that makes it just as much of a display piece as it is a playable set. Despite all that space between the base of the chess set and the board, it is very sturdy. It’s a battle of kings and knights on the board, and both sets of pieces are very well done. The king size is a little on the bigger side, coming in at 3.25 inches. It isn’t too big, and a lot of people actually prefer it for better playability. The first negative is that some people might not like the board being nine inches up in the air off the table. Those used to sets that are not 3D could find themselves needing a little bit of time to adjust. As one might expect, this is a heavy chess set, and a somewhat fragile one as well. Due to those factors, it is not recommended as a traveling option. The board size is a 15″ square, with a height of 9″. The size of the pieces top out at 3.25″ with the king. As mentioned above, this set weighs in at over 25 pounds, making it tough to travel with. Unless it is due to occasional travel, it is not recommended to take apart and build back up on a regular basis. Similar to the first two sets, this is yet another 3D Chess board that brings a little bit of a futuristic look to a class style. The Roman Gladiators make the chess board beautiful, but the base is equally unique. Out of the four examined in this article, this is the most detailed, and the one most likely to catch attention from people who don’t even play chess. It really starts with the base, which is built to resemble the Colosseum. Each corner is built up high enough to support the chess board, but the other parts of the base have details that make people want to rotate it and examine all the details before playing. The board itself sticks with the see through glass look, which is perfect since the details are really on the base. This is a thick piece of glass that locks in perfectly, preventing any worries about the possibility that something might go wrong and break. The pieces have great detail to them, and since they are Roman Gladiator characters, each piece is very unique. This improves playability quite a bit, as a lot of themed sets end up having pieces that are too similar in look at quick glance. Overall, the detail and durability makes this a truly special option for anyone who is a fan of this time period. It’s the priciest option on the list, but the quality and detail is perfect, making it worthy of the price tag. The only real negative with this set is that the pieces sometimes seem a little congested. It might just come across that way because the pieces each have so many details on them, and some of them are wider than the base of the piece. The board in total is a 16″ square, with the playing surfacing being a 13.625″ square. The board is 4.75″ tall. Base weight is over 25 pounds, and the pieces themselves weigh 12.4 pounds. This is another set not designed for frequent travel. A simplistic take on chess with the use of 3D, this set has it all. It varies quite a bit from the other three talked about in this article, but it still does the trick of catching the eye of visitors. From certain angles, this chess board might not seem like anything too crazy. It is not until it is really looked at from all angles to see the 3D stair-step design. It’s a cool way to add a bit of uniqueness to everything, without getting in the way of the game itself. Make of solid wood, the set has distinct colors to make it just as easy to play as it is to put on display. In fact, this is by far the most versatile 3D chess board on this list, mainly because it is so minimalistic. The designs definitely aimed for chic and elegance with this 3D chess set, and reviews are very solid across the board. 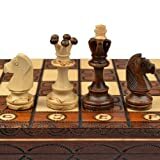 For just under $50, it is hard to find a better unique option for chess fans of all ages. Wood pieces, even made of high quality wood, are easy to mess up. If not careful, this set can appear worn out fairly quickly. Anything from nicks in the wood to splinters can happen. If there is anything wrong with the pieces upon arrival, the company is quick and willing to send a replacement quickly. As one might expect, the size and weight of this set runs on the smaller size. The board is a 13.5″ square, and just over 2″ off the table. The weight of the board is just 4.41 pounds. The pieces have solid weight to them. The king tops out at 2.4″ tall, with the pawn being exactly half the size at 1.2″. The board can be travelled with due to its size and weight, but just be careful with the pieces. A lot of the wood issues tend to happen during travel or when putting the set away in a rush.